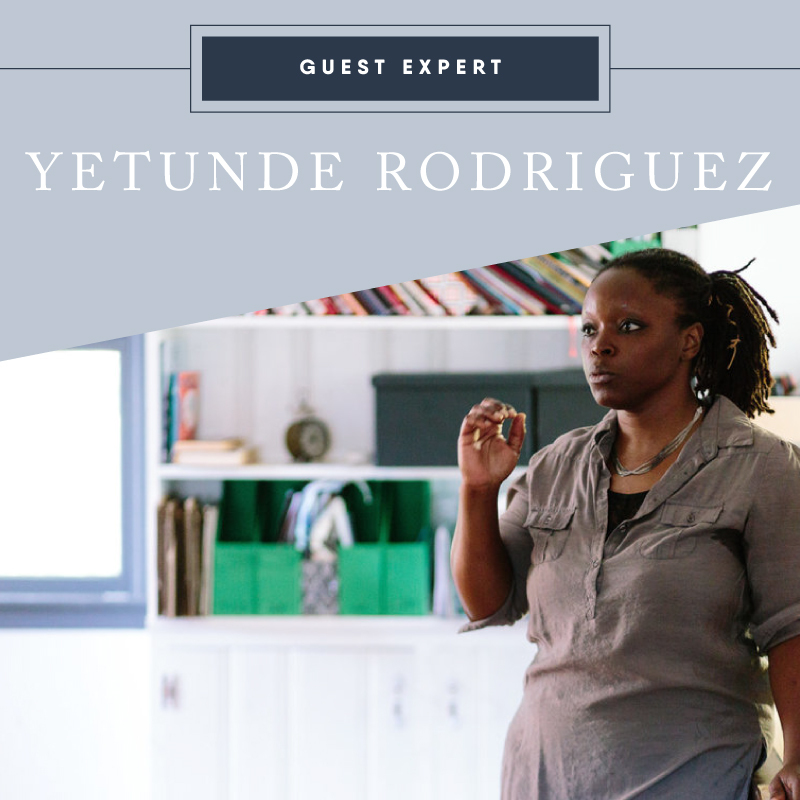 This month we have the privilege to welcome Yetunde Rodriguez to the Textile Design Lab as our guest expert. Yetunde is a Graphic Designer by training. 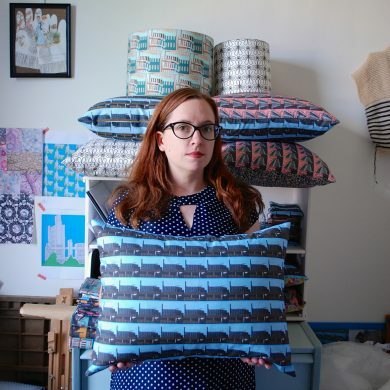 After becoming a self-taught Block and Screen Printer, she launch her online business and Etsy store in 2007. On Monday, October 29th, Yetunde will be in the Lab sharing her thoughts on growing a product-based business and how to combine digital design practices with hand-prints. We invite you to explore this interview with Yetunde to learn more about her work! Tell us a bit about your design background. 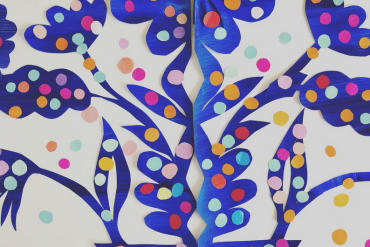 How did you become interested in textile design? It’s funny how something can be all around you but you do not ever wonder how it got there. Even now, when I tell people that I design fabric, they respond with a blank stare. Up until about 12 years ago, it never occurred to me that designing fabric was an actual job. I studied Graphic Design in college and really enjoyed all my classes. I particularly enjoyed the printmaking segments, but did not really see a career use for it. Right around 12 years ago, I started really studying Adinkra symbols. 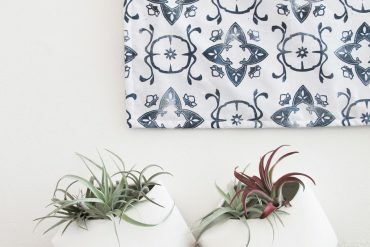 I loved the idea of symbols conveying meanings, and thought it would be really great to interpret these designs in home decor, so that we could have those meanings around us all the time. What inspired you to launch your own product line? Considering that Adinkra symbols are typically found on fabrics anyway, my idea was not novel. However, I wanted to see the symbols interpreted in new fresh ways with fun color combinations. So I set about designing with the symbols. (I have since moved past using adinkra symbols in my work). Since I had no clue about manufacturing and marketing a product line, I did what I knew how to do, which was make it myself, and sell at craft shows, farmers markets and other events of the like. This era coincided with the renaissance of the DIY and Artisan Markets. I figured that the most direct way for me to realize my vision was to actually physically print and sew the items myself, under my own brand name. Could you talk a bit about your design process and the techniques you use to create the prints and products for your brand? I started by teaching myself screen printing. I also dabbled in Block Printing. After struggling with screen printing for a long time, I settled on Block Printing with Stamps. 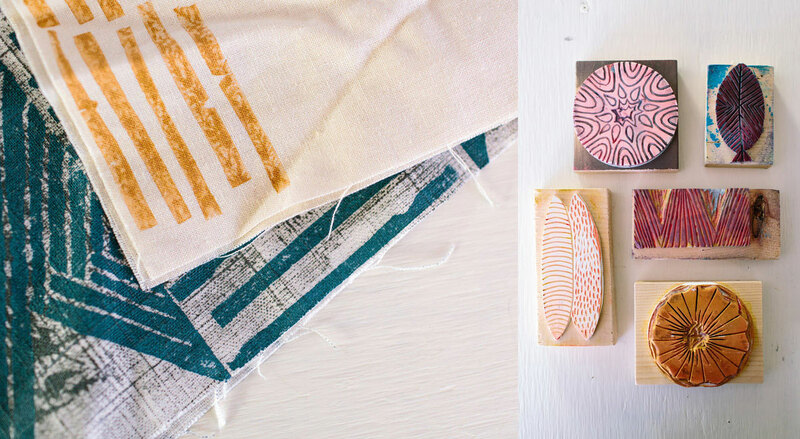 Block printing satisfied my need for simplicity and instant gratification. It is a very basic and rudimentary process that yields beautiful results. I will pretty much carve or cut any material that will carve or cut well and transfer ink/paint. I mostly create my stamps out of craft foam mounted to a either wood or acrylic backing. When I need a little more intricate detail than what cut up craft foam can provide, I will carve up rubber or vinyl in the form of ceiling tiles. I stuck with hand printing fabric because because I really love the organic, slightly imperfect hand. 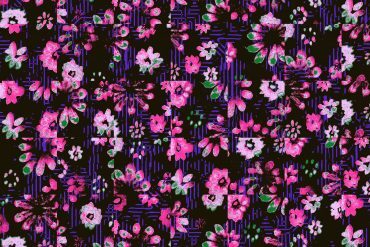 When I discovered Spoonflower, I started digitizing my designs to be printed. As more and more print on demand services have sprung up, it became easier to get some manufacturing assistance. In the beginning of transitioning to digital printing, I struggled with retaining the look I loved so much. Designing digitally also opens up so many options that it is important for me to place limits on myself, otherwise a design might never reach the finish line. 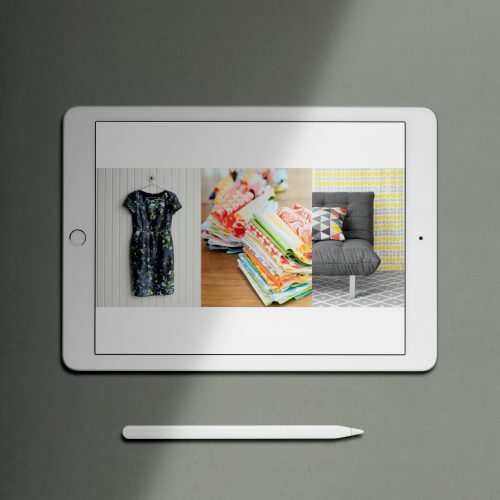 There is also so much possibility with digital design…sometimes too much! I have since learned how to use design software to retain that look in the digital prints, but I still struggle with knowing when to call it done. 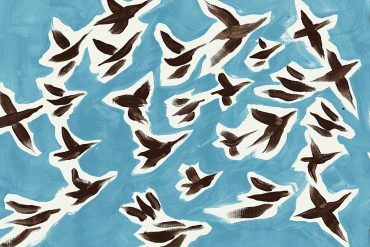 Do you develop your artwork with a specific end product in mind from the get-go, or design first and then decide which products and patterns are a good fit? When carving stamps of abstract motifs, I prefer to improvise. If I try to sit down and pre-think, I will disappear down the rabbit-hole of overthinking and second-guessing. My designs feature a lot of line work, so it’s fairly easy to be improvisational. I usually create designs first, then match them to specific products later. I am partial to home decor items as opposed to apparel so I design with that line in mind. I think I tend to shy away from apparel because with apparel, you have to carefully consider how the print will lay on the body. My designs also do well with bags and gift items. What does a typical day look like for you running your own product line? What are the different roles you take on? I am the only person in my business, therefore I do everything. I am in charge of designing, manufacturing, and marketing, as well as management and bookkeeping. I am better at some things than others 🙂 In the new year I am moving more in the direction of just designing and managing the business side of things. I want to focus on what I enjoy doing and am good at. I have also been taking a lot of business classes so that I can get better at what I’m not so good at. Up till this point my days mostly revolved around printing fabric, sewing and fulfilling orders. 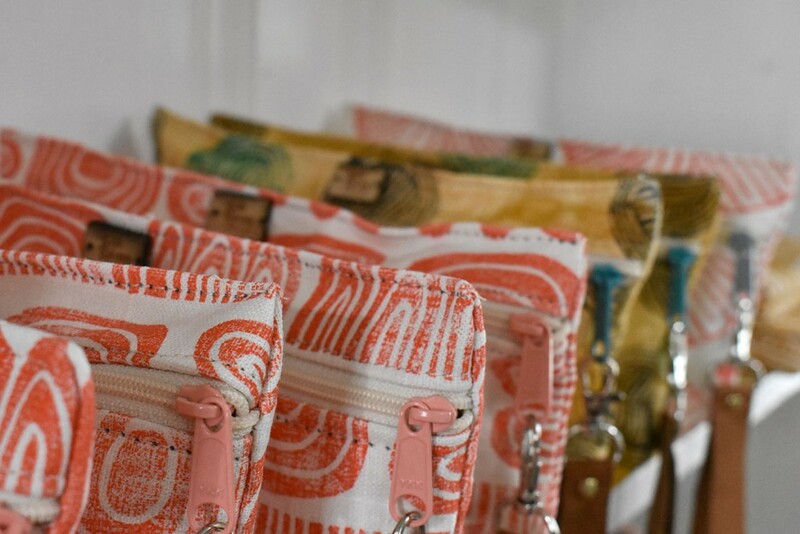 I used to join a lot of markets and craft shows, as well as selling through consignment and on my etsy shop, so I was always building inventory and doing everything related to running a retail business. A typical day will find me responding to emails, if there are any. Then I will consult my calendar of upcoming events and decide what needs to be followed up on for the day. I will do some printing, and some sewing (if need be) before the day is out. What have been some of the challenges or surprises, as well as the exciting moments in having your own product line? Do you have any words of advice for designers considering this path? The main challenge for me is choosing shows and markets to participate in. All markets/shows are not created equal. It is important to really do your homework to try to figure out if a show will be a good match for you. When I first started out, I would sign up for any and every show that I found out about or was invited to. Do not be flattered that a show organizer really wants you! Make sure that the clientele will be a good fit for your product line. I have had some really exciting moments as well. I was accepted as a Whole Foods local artisan vendor in 2015. Having that partnership was super exciting and gave some social clout to my brand. As great as it was, I learned some hard lessons there. I had no idea how to work with a chain store of that magnitude. I did not fully understand how to leverage my product offerings for that store, and therefore it has not been as great as it could have been. More recently I was commissioned to create a mural/design for the exterior facade of our local soon to be built Food Co-op. I have been working with the Architects to create the Art, as well as direct the Interior look of the space. That is probably my most favorite project so far! 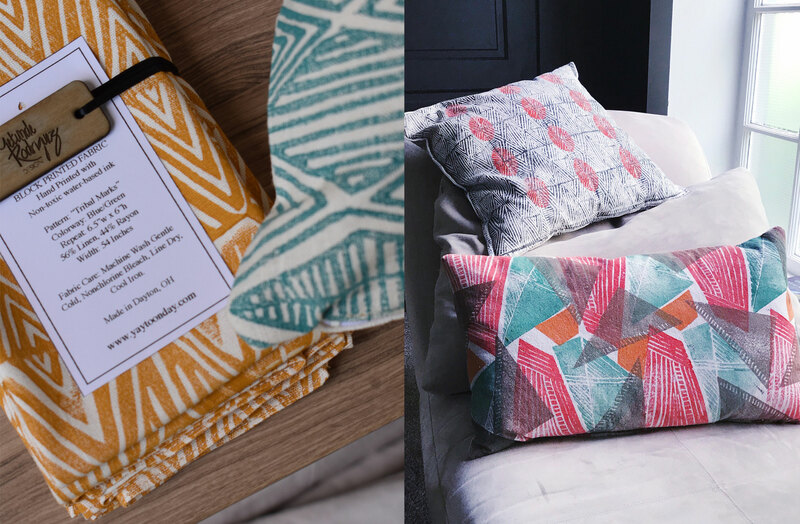 Being involved in this project has opened my eyes to how I could extend the use of my designs beyond textiles. Also, my work is going to be included in the Uppercase Magazine’s upcoming anthology, Print/Maker. I’m very excited and honored to be included with such fine printmakers and I look forward to seeing the book in print. Over the course of your career, what actions or decisions have made the biggest impact on your design business? I think what has been most impactful for me is to be fearless, focus, and keep going! It is easy to get disappointed and want to quit, but if you are really serious, you have to keep going. Almost every other day I feel like I don’t know what I’m doing, but I keep doing it 🙂 Also, I went all in. Mind you, I do not advise this for anyone but myself. I have a good support system in my husband. He has always believed in me, no matter what I want to do. When I decided to focus just on my design business, he believed, even though we could have used the additional (steady) income. Being able to focus, even through doubts, fear, and worry, has really propelled me forward. I am getting opportunities that I would not have if I had not decided to focus. Also, I’m very curious, so as a result, I’m always learning. Even if I already know a lot about something, I still learn something new about it. Also, do things that are outside your comfort zone! Put yourself around people you might not ordinarily meet. I love going to our local Pecha Kucha night to hear about different subjects. I took a chance and signed up to speak at a future event. I was chosen and I decided to speak about block-printing. 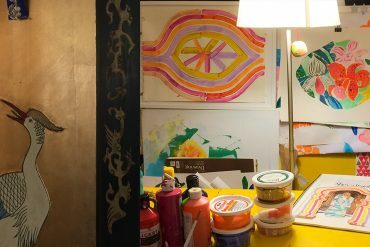 I showed all my colorful prints, as well as my inspiration and origin stories. As it turns out, the Architect that later commissioned me for the Mural of our food co-op was in the audience that day. You just never know! Can you give us a quick preview into the training you will be offering to our Textile Design Lab members? What can people expect to learn? I would like to show how I combine my hand prints with digital printing. I will also share some of print resources that I have discovered. I will also discuss how and where I first started selling, how I found my first customers, and what I’ve done to market my business. Please explore Yetunde’s website and Etsy store to see more of her beautiful products! 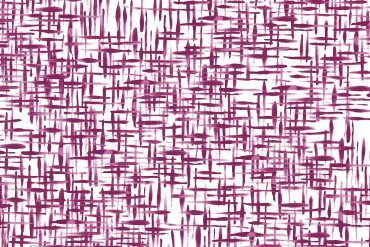 Textile Design Lab members can access Yetunde’s Live Training here. Not a member? Get started here.